Kent Business School’s Employability & Placements Team has been shortlisted for a National Undergraduate Employability (NUE) Award for the Best Collaboration between a University and Employer. 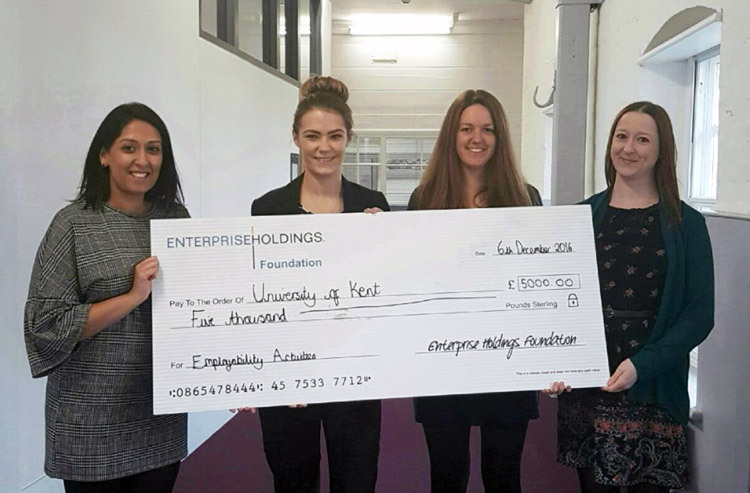 Recognising the relationship between Kent Business School and long-term partner Enterprise Rent-A-Car, this award celebrates the most effective collaborations developed between a university and employer to offer students additional employability skills and opportunities. Other finalists for the award include Cardiff University & Hugh James Solicitors and University of Leeds & The Department for Work and Pensions. Enterprise Rent-A-Car work closely with KBS. They employ a student Campus Brand Manager to raise the company’s profile on campus each year. Enterprise’s Talent Acquisition Team also contribute to, and deliver, employability skills workshops and offer on-campus interviews to fast track KBS students through the recruitment process. As well as this, the organisation donates money for a range of employability activities to support students with developing their skills for the workplace. The National Undergraduate Employability Awards (NUE Awards), is organised by Rate My Placement (RMP), and is entering its eighth year of showcasing the outstanding achievements of organisations, universities and students in undergraduate work experience. This year RMP have organised a line-up of inspirational speakers including Rebecca Adlington OBE and the ceremony will be held 24 February 2017 in Bishopsgate, London. The awards reflect the increasing pool of undergraduate work experience schemes in the market which are on offer for first and second year students across a variety of industries; including placements, internships, vacation schemes and insights. Congratulations to the KBS Employability Team and our partners at Enterprise Rent-A-Car. From CV drop-in sessions and Year in Industry application support, to assessment centre practice and industry speaker events, the KBS Employability & Placements Team supports students at every level of study, for up to three years after graduation. Find out more about how the KBS Employability & Placements Team can support you.